So, what do people think of these new cycle lanes beside Christchurch? All images and photos taken last Sunday evening, and it’s not clear if the work was fully finished or not. Cycle lane /= painted lanes on a road. I had the pleasure of a day in Copenhagen very recently. The difference in their approach, and ours, is mind-blowing. When will we see forward-thinking city planners? I use these most days – its a slight improvement given the fact it’s a junction where the lanes split with one left/straight on turn and two different rights – cars at odd angles everywhere. BUT it’s only as useful as drivers are careful, which at this junction they aren’t. To paraphrase a recent German cyclo-tourist, “you cannot paint the road pink and call it a cycle lane”. Looks like it might raise a bit of awareness, but anything that tells cyclists to move up the inside of left-turning traffic (without actually giving them room nor priority) is a step backwards to me. On a related note, has anyone ever seen a motorist being penalised in any way for stopping in an advanced stop box? Not sure if this has been noted before as I am new to this blog but there’s a real safety issue in the same area: the cycle lane that runs from Patrick Street pedestrian lights and up along Bull Alley Street is handy – until you meet the junction of Bride St/Golden Lane. There, the cycle light is green at the same time that the traffic light for Golden Lane oncoming traffic is green. The result: unwittingly taking on cars that literally have the green light to turn right and cross your path. You only cop this if you are in time to see them turning as you enter Bride St junction. Amazing noone has been smashed and mangled here already. Not worth the paint, and not fair to either cyclists or motorists. Half-lanes or lanes that cannot be respected by motorists are worse than pointless. The very idea of a cycle lane, surely, is to provide a reserved, and to a degree protected, space for cyclists. The ones you show at Christchurch can’t deliver on that intention, but might dangerously suggest to some cyclists that they’re safer than on a road with no marked cycle lane. Good video, well done. it’ll be great when the new narrow cars come in! Where are cars meant to drive? it’s hideous. That’s awful, not even a good effort, embarrassing and very very dangerous……. Not enough space for the Cars not to drive on the Cycle lanes and that Bus is worse of all. 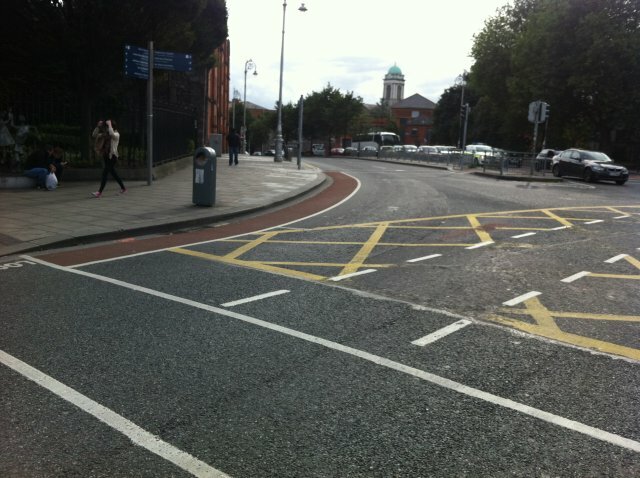 The Cycle Lanes are broken white painted lines allowing the Traffic to drive on them,which in any case they have to. If you want to go straight ahead you have to put your life in danger by trying to get over to the right in heavy traffic sometimes. I suppose they should take a chunk of the paths away to make more room for Bikes and Traffic, even 40cm or 16inches on either side of the road on Christchurch Place might improve it a bit. It is a failure especially dangerous at rush hours. Don’t want to moan too much but with half bike half car all you are doing is causing more confusion and getting drivers used to driving in bike lanes. Things have improved and often a painted lane can help to guide drivers to give you more space. Think it might have been better with just two lanes for cars one for bikes. I think this junction might be perfect for ” green all directions” light ie after every phase of cars the pedestrian lights go and walkers and bikes can clear the junction in any direction from any of the four roads to any exit. If motorists are forced to drive in bicycle lanes like they clearly are at this junction it will devalue all cycle lanes as it will become accepted that the lanes are really just a rough guide and not to be taken too seriously. 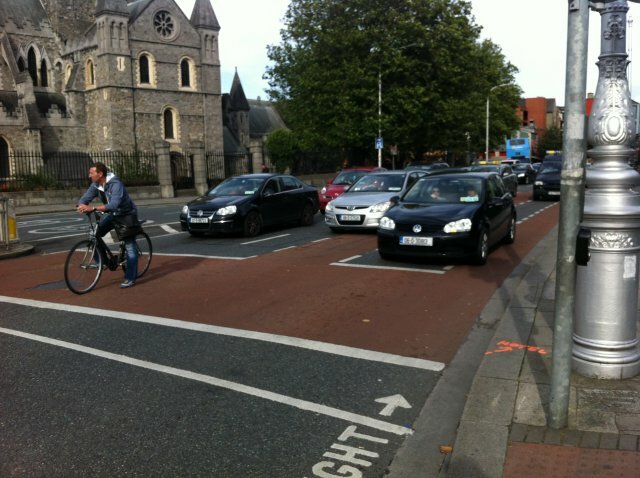 In the top two pictures you can still see part of the problem, cars in the cycle lane. I really believe that it does not matter what part of the road is painted as a cycle lane, cars will always end up there. That entire junction, in every direction, is a total nightmare and a place I would actively try to avoid except I work in that area. Ideally, Cyclists need to be given a lane off the main road and for cyclists and motorists to be more aware of their surroundings and actions. Agree, it’s pointless having such a mish mash – it reduces the impact of cycling lanes and allows car to encroach with cyclists with potentially dire results. Actually John, whether the bus driver is doing it intentionally or not, he is doing cyclists a favor by blocking them from undertaking a large left turning vehicle. Many cyclists gets killed or hurt attempting this. It’s yet another example of a cycle lane that actually endangers cyclists. It would be better if it was just removed. As a way to tot up another few feet of bike path coverage for the council’s metrics, I’m sure it’s great. As a useful service to cyclists, or a safe feature of the road: total fail. A related problem exists in the approach to shared space at St Stephen’s Green south. The cycle lane is wide – full lane – but demarcated by broken white lines and the cycle lane symbols on the lane have all disappeared with time so motorists are up your rear beeping you off “their” lane. Dublin City Council need to stop using icing sugar to mark the cycle lane symbols as it doesn’t last. 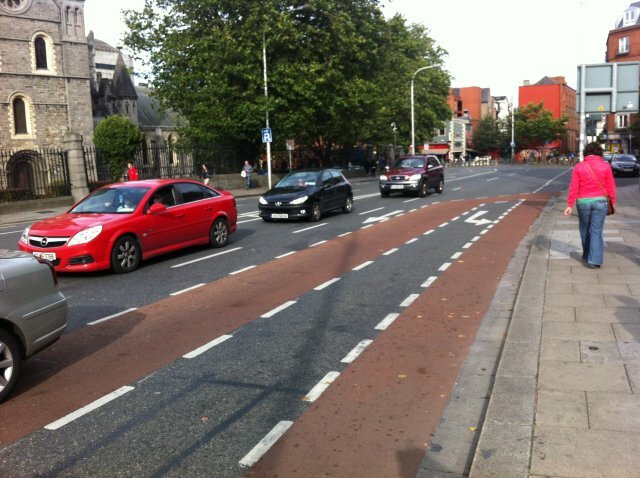 If it was serious about cycle lanes, this would have been identified and rectified long more than a year ago. I nstead, have a physical barrier like the canal cycle path. From a legal point of view, cycle lanes marked with a dashed line, like these, are indeed only a rough guide to motorists. Thanks for posting the video & photos; great blog. Non-mandatory cycle lanes in general can make cycling feel more hostile, and, I believe, more dangerous. I’ve experienced incidents of hostile motorist behaviour, related to the previous poor lane design here. This is a good example of bad design. Should be removed immediately before further incidents are caused. Jesus H. Somebody needs to be sacked for this kind of nonsense. I’m genuinely shocked that this is new.